The annual meeting of the body charged with conserving Atlantic tuna opens on Monday to warnings that this is its "last chance" to manage things well. The International Commission for the Conservation of Atlantic Tunas (Iccat) is criticised for setting high quotas and not tackling illegal fishing. Stocks of bluefin tuna are at about 15% of pre-industrial fishing levels. US Commissioner Rebecca Lent said her country and others feel this is Iccat's last chance to put things right. "We think Iccat is the body that should be managing bluefin tuna, and this is its chance to prove it can do so effectively," she told BBC News from the meeting in Recife, Brazil. "We'd like to have science-based management that has a good chance of stopping overfishing and rebuilding the stock, with effective compliance and monitoring." In recent years, Iccat has routinely set quotas higher than its scientific advisers have recommended, and illegal fishing has put even more pressure on the species. It is estimated that the illegal take adds about 30% to the legal catches. In its last assessment, Iccat scientists noted that the rapid expansion of the fishing industry around the Mediterranean Sea meant "there appears to no longer exist any refuge for bluefin in the Mediterranean during the spawning season". A number of European countries share US reservations about the ineffectiveness of Iccat. This led Monaco to propose regulating the tuna trade through the Convention on International Trade in Endangered Species (CITES), an idea that has garnered support from most EU nations. Others, including the US, would prefer Iccat to allocate quotas that the stock can withstand and then enforce them - but will back the trade ban if it does not. Conservation groups, meanwhile, are pressing for a complete suspension of the fishery - a measure that was recommended by an independent review of Iccat published last year. "For over 30 years, Iccat has wasted countless opportunities to set science-based catch limits and curb overfishing of Atlantic bluefin," said Sue Lieberman, director of international policy with the Pew Environment Group. "A zero quota will show the world that Iccat is ready to heed the science, and recognise the importance of fully alleviating fishing pressure on Atlantic bluefin until stocks recover." The Royal Society for the Protection of Birds (RSPB) is campaigning for Iccat to tighten regulation of longline fishing for tuna and swordfish. 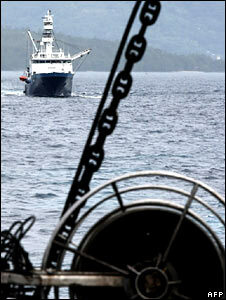 It says threatened species such as albatrosses are routinely caught on hooks deployed by these vessels. "We will be urging delegates to approve rules that make it mandatory for all vessels fishing for tuna and swordfish in the Atlantic to abide by simple measures which lower the risk of albatrosses and other seabirds dying in these fisheries," said Cleo Small, an albatross specialist working with the RSPB. Pew is also pressing Iccat to ban the removal of shark fins at sea - a measure that they say would reduce the toll on sharks, many of which are recent additions to the threatened species list.